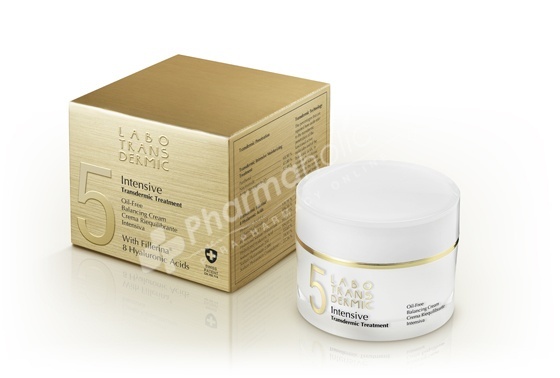 Labo Transdermic Oil-Free Balancing Cream restores normal balance of oily and combination skin. This formula is ideal for balancing oily skin with imperfections, acne and dilated pores, oil-free composition is a very effective balancing and matte effect, also suitable for particularly sensitive skins with imperfections. Azelaic acid acts against excess sebum production and helps reduce the formation of poisonous and black spots. The 8 molecules of Hyaluronic Acid with a different molecular weight of the Fillerina complex, penetrate differently into the skin layers, both on the epidermis and the dermis, providing the skin with substantial benefits. Apply to the face and neck with upward movements until it is fully absorbed.